A Calgary basketball player will have his customized wheelchair with him after all when he heads to a national team tryout in Toronto next month. 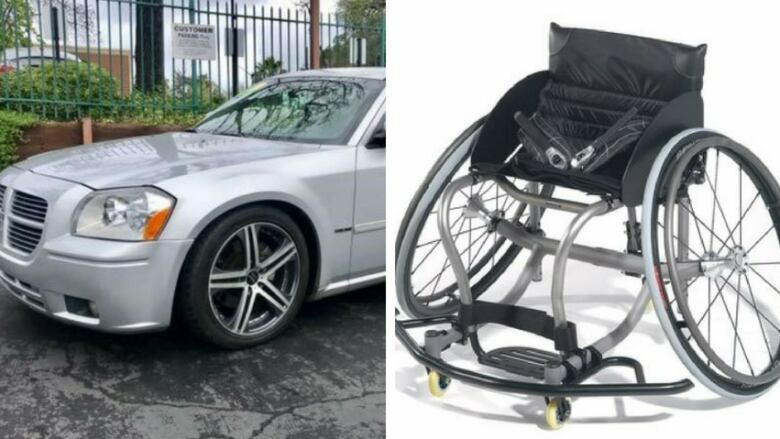 The actions of a Calgary pastor have led to the return of a stolen car and customized wheelchair belonging to a disabled athlete, who can now use it at a national team tryout next month. Pastor John Huh noticed a Dodge Magnum with tinted windows parked outside his office at the Goodtree Christian Fellowship in northwest Calgary when he left Monday evening. The car stood out, he says, because it's a unique model. But with four churches sharing space at the building, it didn't seem out of the ordinary at the time. "It's an odd car, but I thought maybe it belonged to someone else in the church," he said. On the way home, however, Huh heard a radio report about police searching for the same model car — which had been reported stolen by Dalten Campbell from his Inglewood residence last week — and when Huh arrived back to work Tuesday morning, it was still sitting in the parking lot. "I checked the plates with what was on the news and called police," he said. Fearing someone might return, Huh blocked the Dodge in with his own vehicle until officers arrived. "All the windows were tinted pretty heavily so you couldn't see inside," he said. Inside the car was Campbell's customized wheelchair, which he has been using to train for the past two years. Next month, Campbell is headed to a tryout with the Canadian Paralympic Basketball team in Toronto. "The wheelchair is in perfect condition. I don't think they even touched it, the wheels were left as I usually stack them in my car," he told The Homestretch on Tuesday afternoon. "As far as my vehicle goes, there's a little bit of damage but nothing crazy. They just tried to rip out ... my stereo system, and there's a couple little things that have been ripped out on the inside. But as long as I have that chair back, I'm a very happy man." Campbell told The Homestretch a day earlier he was worried about how he'd perform without his chair, as it is measured down to the centimetre and formed to fit his body exactly. Getting a replacement wasn't an option as the chairs take months to make. "Words really cannot convey how grateful I am to have been able to rely on your assistance and the assistance of the community of Calgary as a whole," he wrote in a text message to CBC.